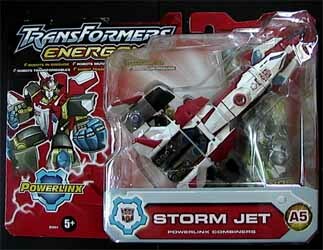 Storm Jet is one of five collectible vehicles with an aviation theme (models in this range various types of planes) which can be fitted together to build Superion Maximus. Each collection of five vehicles will set you back around £35 (each one is priced £6.99 - apart from the transformer that makes up the body of the larger transformer, which is £9.99). That's not bad value for money when you add up what you are getting here - five vehicles that transform into six (if you include the mega Superion Maximus) different robots.